Well hello there again. It has been almost a week since our last build to production which quite frankly is too long. I'll be getting us back to more regular updates, after all we have a long list of improvements planned for you in the coming weeks and months. Today's build comes with its own set of really nice improvements and new features. One nice new feature is the ability to deauthorize a device. Your My Profile page in your 1Password account contains a list of your currently authorized devices. 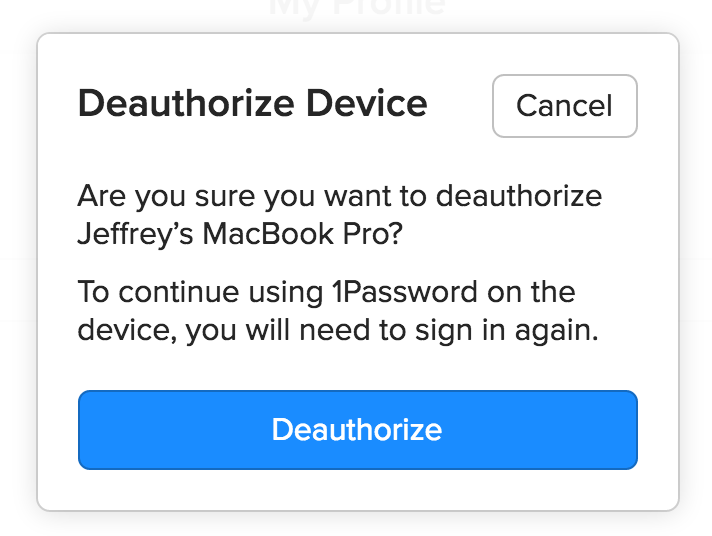 If you have a device on there that you no longer want connected to your 1Password account you can now click on the "X" beside that device to deauthorize it. Once deauthorized, you will not be able to use your 1Password data on that device until you re-add your account. [NEW] Owners and Admins can now manage all groups. [NEW] Added the ability to remove authorized devices. [NEW] In vault view, you can now add multiple websites to a Login item. [NEW] In vault view, added a keyboard shortcut (⇧⌘M) for admins to open the vault they're currently viewing in the admin console so they can manage it. [IMPROVED] You can now remove yourself from a group if you can manage the group. [IMPROVED] Make invoices easier to read when team members are added or removed.